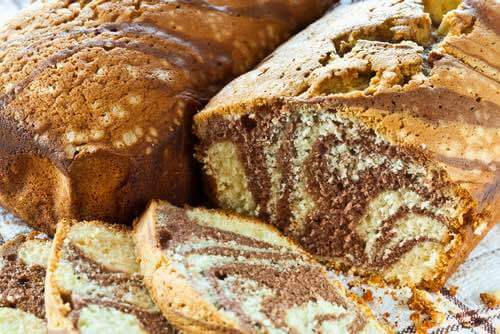 Old fashioned cake recipes from scratch were invented by Pennsylvania German cooks to make a variety of cakes that were especially delicious and appealing. 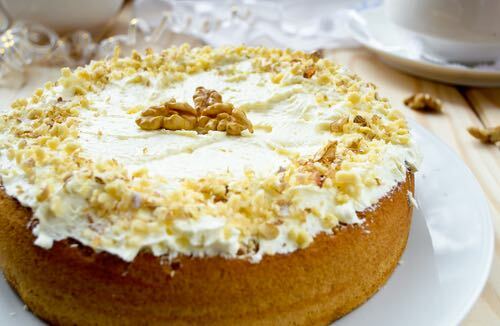 For instance, a never fail, basic white cake recipe can be cleverly adapted to make a variety of dessert cakes simply by altering a few ingredients or the baking method. Continue reading as Aunt Sarah Landis shares her pioneer cake baking secrets. Experience a practical cake baking class that reads as an entertaining story. Yes, you can learn to bake cakes like Grandma's. Prepare to step back in time to the early 1900s and enter the cosy farm kitchen of Aunt Sarah Landis, a traditional Pennsylvania German housewife. Pretend to listen in as Aunt Sarah shares her cake baking tips and experience with her young niece Mary. Learn how to create an amazing variety of cakes using cake recipes from scratch adapted from one simple recipe. 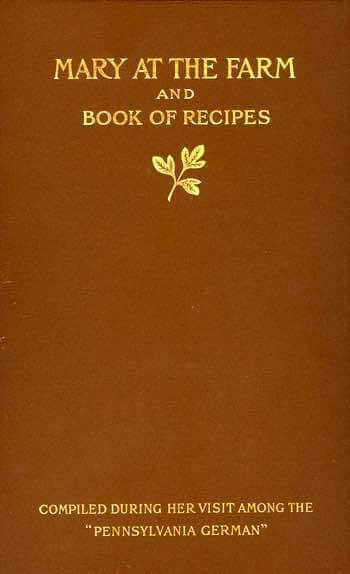 You'll also be given her old fashioned recipes for angel food cake and a mouth-watering gold cake. Plus, there's Frau Schmidt's traditional German doughnut recipe for Fast Nacht Kuchen, a sweet treat traditionally served on Shrove Tuesday, the day before the start of Lent. But, you'll love to eat them anytime! So, pull your chair closer and take notes as Aunt Sarah shares how to bake her favorite cake recipes from scratch. "Aunt Sarah," questioned Mary one day, "will you tell me how it is possible to evolve a number of cakes from one recipe?" "Certainly I will, my dear," said her Aunt (pictured above). "For instance, take the simple recipe from which I have for years baked layer cake. You may have other cake recipes from scratch given you, equally as good, but I feel positive none are better. "The cake made from this recipe is not rich enough to be unwholesome, but a good, reliable, inexpensive, easily made white cake, with which I have NEVER had a failure. "The recipe, as you know, consists of 1-1/4 cups of granulated sugar, 1/2 cup of a mixture of butter and sweet lard (or use all butter), 1/2 cup sweet milk, 2 cups flour, and 2 teaspoonfuls baking powder. And 3 eggs. "The simplest manner of baking this cake is in two square cake pans. When baked, take from pans and ice each cake with a boiled chocolate icing and put together as a layer cake, or ice each cake with a plain, boiled white icing and, when this is cold, you may spread over top of each cake unsweetened chocolate, which has been melted over steam after being grated. "When cake is to be served, cut in diamonds or squares. Or add to the batter 1 cup of chopped hickory nut meats, bake in 2 layers and cut in squares. "For a chocolate loaf cake, add two generous tablespoonfuls of unsweetened melted chocolate to the batter just before baking. If you wish a chocolate layer cake, use the same batter as for the chocolate loaf cake, bake in two layer pans and put together with white boiled icing. "Or, add to this same batter one scant teaspoonful of cinnamon, ginger, 1/2 teaspoonful of grated nutmeg and cloves, a cup of raisins or dried currants, and you have a small fruit cake. "Or, add a small quantity of thinly shaved citron to the original recipe, flavor with lemon, bake in a loaf and spread a white icing flavored with lemon extract over top of cake, and you have a lemon cake from scratch. 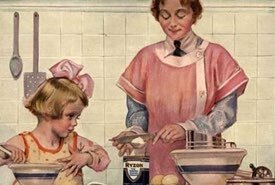 "Or, add chocolate and spices to one-half the batter (about one-half as much chocolate and spices as were used in batter for fruit cake) and place spoonfuls of the light and dark batter alternately in a cake pan, until all batter has been used, and you will have a cheap, old fashioned marble cake. "Or, bake cake over original recipe, in two-layer pans, placing between layers either tart jelly, a creamy cornstarch filling, grated cocoanut, apple cream filling, or you might even use half the recipe given for the delicious icing or filling for Lady Baltimore cake. "Lastly, bake small cakes from this same recipe. Mary, you should have small pans for baking these delicious little cakes, similar to those I possess, which I ordered made at the tinsmith's. I took for a pattern one Frau Schmidt loaned me. "They are the exact size of one-quarter pound boxes of Royal baking powder. Cut the box in three pieces of equal height, and your cakes will be equally as large in diameter as the baking powder box, but only one-third as high. "I think I improved on Frau Schmidt's cake tins, as hers were all separate, I ordered twelve tins, similar to hers, to be fastened to a piece of sheet iron. I had two of these iron sheets made, containing twenty-four little pans. "I place a generous tablespoonful of the batter in each of the twenty-four small pans, and cakes rise to the top of pans. Usually, I have batter remaining after these are filled. Ice all the cake except the top with a white boiled icing or chocolate icing. These small cakes keep exceedingly well, and are always liked by young folks and are particularly nice for children's parties." "Speaking of cakes, Aunt Sarah," said Mary, "have you ever used Swansdown cake flour? I have a friend in the city who uses it for making the most delicious Angel cake, and she gave me a piece of Gold cake made from a recipe in 'Cake Secrets,' which comes with the flour, and it was fine. "I'll get a package of the flour for you the first time I go to the city. The flour resembles a mixture of ordinary flour and cornstarch. It is not a prepared flour, to be used without baking powder, and you use it principally for baking cakes. "For making the Angel cake from scratch, use one even cupful of the whites of egg (whites of either eight large or nine small eggs); a pinch of salt, if added when beating eggs, hastens the work. One and one-quarter cups granulated sugar, 1 cup of Iglehart's Swansdown cake flour. "Sift flour once, then measure and sift three times. Beat whites of eggs about half, add 1/2 teaspoonful of cream of tartar then beat whites of eggs until they will stand of their own weight. Add sugar, then flour, not by stirring, but by folding over and over, until thoroughly mixed. Flavor with 1/2 teaspoonful of vanilla or a few drops of almond extract. "As much care should be taken in baking an Angel Food cake as in mixing. Bake in an ungreased patent pan. Place the cake in an oven that is just warm enough to know there is a fire inside the range. Let the oven stay just warm through until the batter has raised to the top of the cake pan, then increase the heat gradually until the cake is well browned over. "If by pressing the top of the cake with the finger it will spring back without leaving the impression of the finger, the cake is done through. "Great care should be taken that the oven is not too hot to begin with, as the cake will rise too fast and settle or fall in the baking. It should bake in from 35 to 40 minutes' time. "When done, invert the pan and let stand until cold before removing it. Should you see the cake browning before it rises to top of pan, throw your oven door open and let cold air rush in and cool your oven instantly. Be not afraid. The cold air will not hurt the cake. Two minutes will cool any oven. Watch cake closely. Don't be afraid to open oven door every three or four minutes. This is the only way to properly bake this cake. "When cake has raised above top of pan, increase your heat and finish baking rapidly. Baking too long dries out the moisture, makes it tough and dry. "When cake is done it begins to shrink. Let it shrink back to level of pan. Watch carefully at this stage and take out of oven and invert immediately. Rest on centre tube of pan. Let hang until perfectly cold, then take cake carefully from pan. "When baking Angel cake always be sure the oven bakes good brown under bottom of cake. If cake does not crust under bottom, it will fall out when inverted and shrink in the fall." "I never invert my pans of Angel cake on taking them from oven," said Mary's Aunt, "as the cakes are liable to fall out even if the pan is not greased. I think it safer to allow the pans containing the cakes to stand on a rack and cool without inverting the pan. "Suppose, Mary, we bake a Gold cake over the recipe from 'Cake Secrets,' as eggs are plentiful; but we haven't any Swansdown flour. I think we will wait until we get it from the city." Yolks of 8 eggs; 1-1/4 cups granulated sugar, 3/4 cup of butter, 3/4 cup water, 2-1/2 cups of Swansdown cake flour, 2 heaping teaspoonfuls of baking powder, 1/2 teaspoonful lemon extract. Sift flour once, then measure. Add baking powder and sift three times. Cream butter and sugar thoroughly; beat yolks to a stiff froth; add this to creamed butter and sugar, and stir thoroughly through. Add flavor, add water, then flour. Stir very hard. Place in a slow oven at once. Will bake in from 30 to 40 minutes. Invert pan immediately it is taken from oven. This batter may also be baked in layers with any kind of filling desired. "The Angel cake recipe is very similar to an original cake recipe from scratch that Frau Schmidt (picture at left) gave me," said Aunt Sarah; "she uses cornstarch instead of Swansdown flour and she measures the eggs in a cup instead of taking a certain number; she thinks it more exact." "Aunt Sarah, did you know Frau Schmidt, instead of using flour alone when baking cakes, frequently uses a mixture of flour and cornstarch? She sifts together, several times, six cups of flour and one cup of cornstarch, and uses this instead of flour alone. "I dearly love the Professor's " wife — she's been so very good to me," exclaimed Mary. 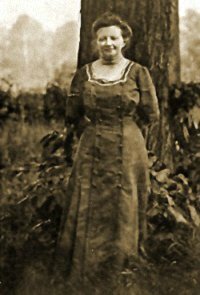 Mary's liking for bright, energetic Frau Schmidt was not greater than the affection bestowed on Mary by the Professor's wife, who frequently entertained Mary with tales of her life when a girl in Germany, to all of which Mary never tired listening. One of the things in which she particularly excelled was potato cakes raised with yeast. Frau Schmidt had been given a number of these valuable cake recipes from scratch by her mother, all of which she offered to Mary. One of the cake recipes from scratch that she particularly liked was for "Fast Nacht Cakes," which the Professor's wife baked always without fail on Shrove Tuesday (or "Fast Nacht" day), the day before the beginning of Lent. This rule was as "unchangeable as the law of Medes and Persians," and it would have been a very important event, indeed, which would have prevented the baking of these toothsome delicacies on that day. The lukewarm, scalded milk, mixed into a smooth batter with 1 quart of flour; add 1 Fleischmann's® yeast cake, dissolved in a very little water. Beat well together, set in a warm place to rise overnight, or several hours, and when light, add the following, which has been creamed together: eggs, butter and lard, a little flour, and the honey. Beat well, and then add the balance of the flour, reserving a small quantity to flour the board later. Set to rise again, and when quite light roll out on a well-floured board, cut into circles with a doughnut cutter, cut holes in the centre of cakes, let rise, and then fry in deep fat; dust with pulverized sugar and cinnamon, if liked. These are regular German doughnuts, and are never very sweet. If liked sweeter, a little sugar may be added. From this batter Mary made 18 "fried cakes," or "Fast Nacht Kuchen," as the Germans call them. Frau Schmidt also made from the same dough one dozen cinnamon buns and two Dutch cakes. The dough not being very sweet, she sprinkled rivels composed of sugar, flour and butter, generously over the top of the "Dutch cakes." The dough for doughnuts, or fried cakes, should always have a little more flour added than dough for "Dutch cakes" or buns; baked in the oven. If too soft, they will absorb fat while frying. You'll want to keep these versatile cake recipes from scratch handy in your kitchen to make a variety of wholesome treats.